In the West, the recent attacks on Israeli citizens is treated as just another element of the ongoing violence between Palestinians and the occupying state of Israel. And, if as a Romans 11 Believer, I am called a "Christian Zionist" when I decry the bloodshed of innocent Israelis, then so be it. As I explained in a recent blog, my approach to the situation in Israel is from a Biblical (and "big picture") perspective. The current state of Israel -- in all its nationalistic, political, and largely secular condition -- is not yet that Biblical nation of Israel with whom God established a covenant .... but one day it will be. Until then, it is still God's beloved Zion, with whom He has established an eternal covenant to bless all the earth. We're at the beginning stages; they are "back in the land" and moving towards their prophetic role and purpose of leading the world to God. In the meantime, the world is throwing everything it can at them; just as the Bible tells us it will be. But I find the manner in which the media is treating the current violence rather ironic. Last year's violence in the so-called "Gaza war", found the world's media condemning the deaths of innocent Palestinians (even they were being used as human shields by Hamas). But, now when the victims of the latest rock-throwing, gun ambushes, and stabbings with knives and screw drivers happen to be Israelis, the media's attention is noticeably smaller. Amid unfounded rumors that Israel is planning to destroy, or at least confiscate, the Temple Mount, there has risen a spate of hate-crazed, religiously motivated attacks. In the Old City of Jerusalem a young man, his wife, and their two children (in baby strollers) were attacked with a knife. The young father was killed, along with another innocent bystander. And as the mother lay on the ground, she cried out for Palestinian shopkeepers to help her. The shopkeepers spat on her, and the Palestinian youths responsible for the attack cursed at her; one of them slapped her and another laughed in her face and told her to “drop dead” when she told him she’d give him a million shekels if he helped her get away with her two babies. When reporting the brutal attack, did the BBC lament the unprovoked attack? No. Their headline read, Palestinian Shot Dead After Jerusalem Attack Kills Two. 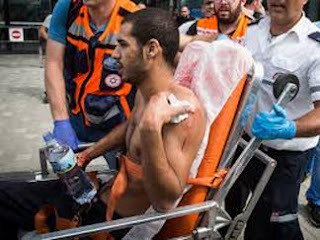 In recent days, there have been 7 Israelis killed and dozens wounded in four different shooting, car ramming and stabbing attacks in Jerusalem and central Israel -- all attacks against innocent Israeli citizens. The response to such unsolicited attacks have left at least 30 Palestinians (the attacks among them) dead. Yet the world equates what they call "Israeli occupation" with South African apartheid and its associated pain, suffering, discrimination and no hope that things will ever change. And our Secretary of State, John Kerry, announces to the world audience, "I am not going to point fingers from afar at who's responsible for violence." 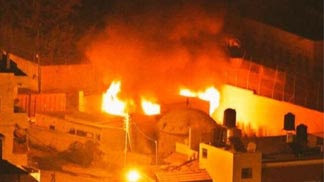 Perhaps the world and the media can no longer avoid the true perpetrators after Friday's torching of Joseph's Tomb, one of the holiest shrines in the Holy Land. The Tomb is the funerary monument to Joseph, one of the Patriarchs of the nation of Israel. It has been venerated for centuries by Jews, Samaritans, Christians and Muslims. But such is the hatred for the Jews in their ancestral homeland, that attackers would choose to firebomb the holy site in retaliation for their very presence. The tomb is located in a compound in the city of Nablus, and was transferred to Palestinian control in 1995. It was ransacked and burnt by Palestinian rioters at the start of an uprising in October, 2000; and currently, Jewish pilgrims are only permitted to visit at night, once a month go pray, and under Israeli military protection. And still the world lays the ongoing violence at the feet of the Jews. It doesn't seem to matter that school text books used by Palestinian Muslim children give classroom instruction on "How To Stab A Jew". Or that the Palestinian terror group HAMAS is celebrating the Palestinian murders of two Israelis on a Jerusalem bus last week by distributing a sick re-enactment film. In the eyes of the world, its governing bodies, and the biased media coverage, this is a one-sided conflict, and Israel and the Jews deserve no consideration. I have no reason to think that these attacks will subside in the near future. In fact, there seems to have been a steady stream of attacks in the recent past. So, as we watch the increasing tension in the Middle East, we see the Biblical End Times enemies of Israel aligning against her, and we know where this is headed. No amount of effort by Western leaders in Washington and European capitals, as well as at the United Nations, will result in a permanent "peace process" that will divert the inevitable march of Israel's enemies towards the battle in the Valley of Megiddo. But we can pray for God to strengthen His hedge of protection around the faithful Jews in Israel; around those who are faithful to their covenant with Him. Those Messianic-believing Jews, those who have kept their part of the covenant, will experience perfect and blameless shielding from all their enemies. The Bible tells us that the Lord will have a holy people in these Last Days. That remnant is living in Israel today; yes, even in the midst of their worldly, lost and blinded countrymen. And it is because of them that I care what is going on in Israel; that I take notice of increasing and almost daily violence. And it is because I do not want any Israeli Jew to lose their life before having the opportunity to recognize their Messiah. So I will continue to pray for Jerusalem and that God will never again cede her to her enemies. Special consideration: I would like to extend my deep and sincere sympathy to the family of Jack Kelley, a Christian writer and founder of the website ministry "Gracethrufaith.com". Jack's writing always provided me with a clear picture of the full counsel of God's Word, and I often referenced it in my own writing. Jack was unexpectedly diagnosed with cancer and received the ultimate healing in just a matter of days. Please pray for his family and thank God for all the work Jack Kelley did for His kingdom while on earth. It is only appropriate that I share how Jack answered a question regarding the loss of a loved one. Please read how Jack glorified God in his response and, ultimately, in his life. Isaiah 61:3 The Spirit of the Lord is upon me ... To grant to those who mourn in Zion the following: To give them a turban instead of dust [on their heads, a sign of mourning]; The oil of joy instead of mourning; The garment [expressive] of praise instead of a disheartened spirit. So they will be called the trees of righteousness [strong and magnificent, distinguished for integrity, justice, and right standing with God], The planting of the Lord, that He may be glorified. In regard to your comment about Jews recognizing the Messiah, I thoought you would find this post interesting. Thank you for this link! And I plan on writing a blog on this subject very soon. Praise the Lord, our prayers are being answered!!! Amen sister on the article! It is very sad to see so many of the "mainline churches" in America turning against Israel when God commands us to be a blessing to the Jews/Israel. Replacement theology has been a terribly wrong interpretation of scripture. Anti-semitism = demonic. I totally agree! It is just another lie that Satan tells to lukewarm Christians.